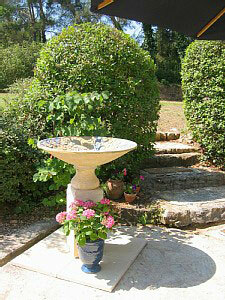 Aix-en-Provence, is only approximately 7 kms from this lovely old Provencal ‘Mas’. Aix, famous for its summer festivals, fountains and cultural events, was the Capital of Gaul in the Roman times, and is best known as the city of Cezanne’s canvasses, amazing shops, restaurants and museums. (Cours Mirabeau is one of Europe’s finest streets). Have an aperitif and do some relaxing people-watching at Les Deux Garcons (known locally as Les Deux Gas),one of France’s most famous and historic bars. 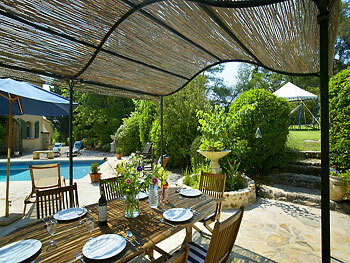 This charming, traditional light-filled Provençal villa with 5 bedrooms, 3 bathrooms, a wonderful rambling garden and generous living space, with 9m x 5m pool has 2 weeks in August still available on last minute special offer. The centre of beautiful and lively Aix-en-Provence is only 5 minutes drive – Villa du Jardin is the perfect place from where to explore one of France’s oldest and most attractive Roman cities.and this property is only half a kilometre from a village; so one can indulge in simple pleasures like going to get your baguette in the morning from the boulangerie on foot. Forest walks a minute away. Rural Provence, with its beautiful traditional villages, scenery and light that has attracted generation after generation of artists is also on your doorstep and the Mediterranean is less than 30km away. 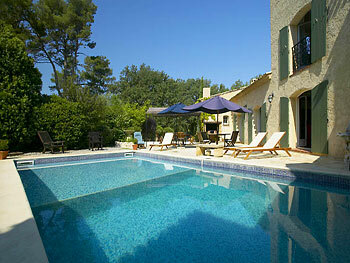 But you could just as happily lie by the pool smelling the lavender in the garden and nearby Mediterranean forest pines!